It's my birthday. That's right. And I'm featuring some recipes I would love to eat right this second. Make simple syrup: In a saucepan over low heat, warm sugar in 1 cup water until dissolved. Cool to room temperature before using. (There will be extra syrup; refrigerate if not using immediately.) In a cocktail shaker filled with ice, shake gin or Cognac, lemon juice and syrup. 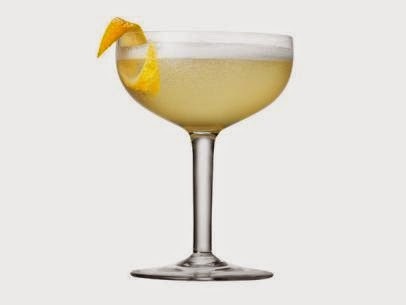 Strain into chilled flute or cocktail coupe. Top with Champagne. Garnish with lemon twist. Preheat oven to 375 degrees F. Lightly oil an 8×8 baking dish or coat with nonstick spray. Heat olive oil in a large skillet over medium high heat. Add chorizo and cook until dry and crisp, about 2 minutes, making sure to crumble the chorizo as it cooks. Add red onion, bell pepper and jalapeños and cook until the onions begin to soften, about 3-4 minutes. Whisk in flour until well combined. Then gradually whisk in milk and cook, whisking constantly, until incorporated, about 1-2 minutes. Whisk in cheeses until smooth, about 1-2 minutes. Remove from heat. 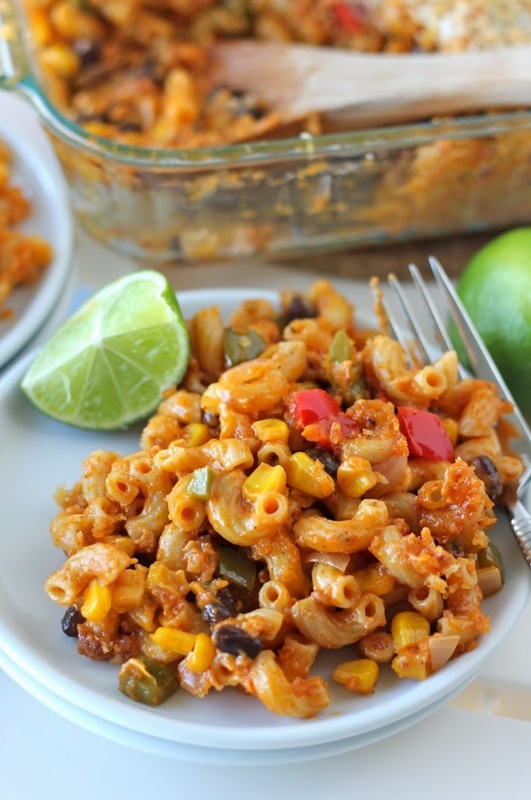 Stir in pasta, corn, black beans and lime juice. Spread pasta mixture into the prepared baking dish. Sprinkle Panko evenly over the top. Place into oven and bake for 20-25 minutes, or until golden brown. Preheat the oven and warm the cream cheese: Preheat the oven to 350°F with a rack in the lower-middle position. Take the blocks of cream cheese out of their boxes and let them warm on the counter while you prepare the crust, about 30 minutes. Rub the pan with butter: Use your fingers to rub a small pat of butter all over the bottom and sides of the pan. Wrap the pan in foil: Cut two large pieces of foil and lay them on your work surface in a cross. Set the springform pan in the middle and fold the edges of the foil up around the sides of the pan. The foil gives you extra protection against water getting into the pan during the water bath step. Bake the crust: Place the crust in the oven (be careful not to tear the foil). Bake for 8 to 10 minutes until the crust is fragrant and just starting to brown around the edges. Let the crust cool on a cooling rack while you prepare the filling. Mix the cream cheese, sugar, cornstarch, and salt: Combine the warmed cream cheese, sugar, cornstarch, and salt in the bowl of a stand mixer fitted with a paddle attachment (or use a handheld mixer). Mix on medium-low speed until the mixture is creamy, like thick frosting, and no lumps of cream cheese remain. Scrape down the beater and the sides of the bowl with a spatula. Mix in the sour cream, lemon juice, and vanilla: Add the sour cream, lemon juice, and vanilla to the bowl and beat on medium-low speed until combined and creamy. Scrape down the beater and sides of the bowl with a spatula. Mix in the eggs and yolk one at a time: With the mixer on medium-low speed, beat in the eggs and the yolk one at a time. Wait until the previous egg is just barely mixed into the batter before adding the next one. At first, the mixture will look clumpy and broken, but it will come together as the eggs are worked in. Stir a few times by hand: Scrape down the beater and sides of the bowl with a spatula. Stir the whole batter a few times by hand, being sure to scrape the bottom of the bowl, to make sure everything is incorporated. The finished batter should be thick, creamy, and silky. Don't worry if you see a few specks of un-mixed cream cheese here and there; they will melt into the batter during baking and won't affect the finished cheesecake. Pour the batter over the cooled crust: Check to make sure the crust and the sides of the pan are cool — if they're cool enough to comfortably touch, you can go on. Pour the batter over the cooled crust and spread it into an even layer against the sides of the pan. Transfer the pan to the water bath: Transfer the pan to a roasting pan or other baking dish big enough to hold it. Bring a few cups of water to a boil and pour the water into the roasting pan, being careful not to splash any water onto the cheesecake. Fill the pan to about an inch, or just below the lowest edge of foil. Bake the cheesecake: Bake the cheesecake at 350°F for 50 to 60 minutes. Cakes baked in a 10-inch pan will usually cook in 50 to 55 minutes; cakes in a 9-inch pan will cook in 55 to 60 minutes. The cheesecake is done when the outer two to three inches look slightly puffed and set, but the inner circle still jiggles (like Jell-o) when you gently shake the pan. Some spots of toasted golden color are fine, but if you see any cracks starting to form, move on to the next step right away. Cool the cheesecake in the oven: Turn off the oven and crack the door open. Let the cheesecake cool slowly for one hour. Run a knife around the edge of the cake and cool the cake completely: After an hour, remove the cheesecake from the oven and from the water bath, unwrap the foil, and transfer it to a cooling rack. Run a thin-bladed knife around the edge of the cake to make sure it's not sticking to the sides (which can cause cracks as it cools). Let the cheesecake cool completely on the rack. 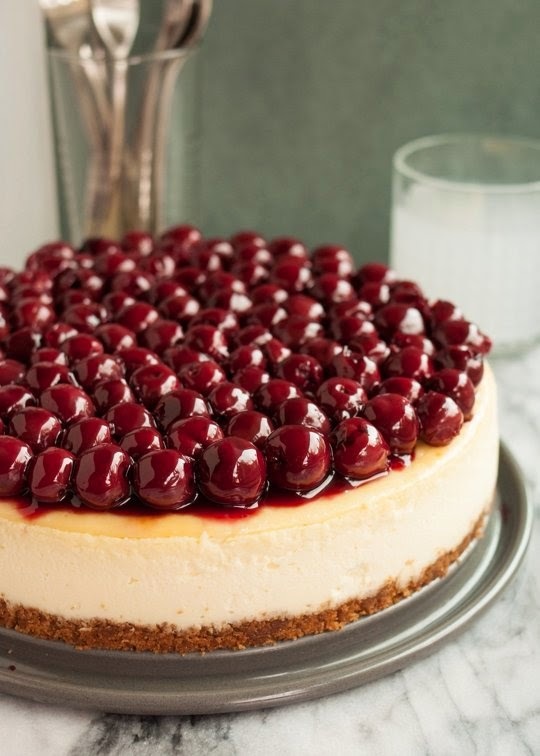 Chill the cheesecake for four hours in the refrigerator: Chill the cheesecake, uncovered, for at least four hours or up to three days in the refrigerator. This step is crucial for letting the cheesecake set and achieving perfect cheesecake texture — don't rush it. Top the cheesecake and serve: Take the cheesecake out of the fridge about 30 minutes before you plan to serve. Unmold the cake and top the cheesecake just before serving. You can serve the cake right from the bottom of the springform pan, or use a large off-set spatula to gently unstick the crust from the pan and transfer it to a serving platter. Leftovers will keep, uncovered and refrigerated, for several days.